Powerful enough to provide air to three operating tools at once, with the same footprint as a less powerful machine, your customers will love getting higher output with lower operating costs. 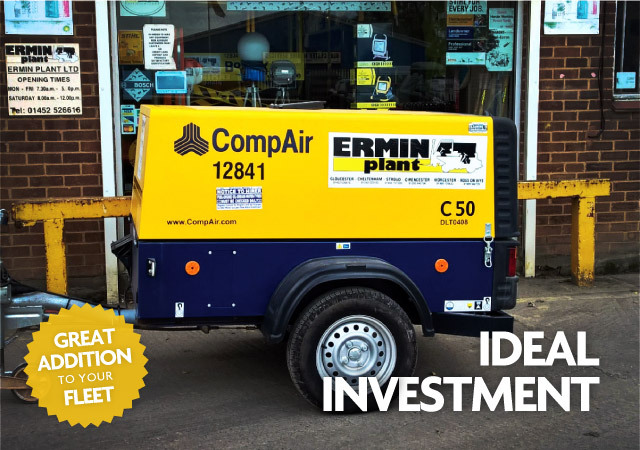 Satisfy your customer demand, and increase business opportunities by offering new and existing customers portable compressed air with the CompAir C50. The C50 compressor from CompAir runs on a quiet, water cooled, 4-cylinder diesel engine, suitable for applications in areas with stringent noise restrictions. Weighing under 750kg, the C50 is compact, lightweight and easily towable. The hinged hood design makes it easy to service and maintain, ensuring minimal customer downtime.